First thing you should know about Samsung SCX-4725FN is that it is a multifunctional printer. This mean you can do numerous actions — print, copy scan and send faxes — all from a single device. Having learned that, let’s see what’s more there is. The SCX-4725FN is marketed as a network device. The manufacturer says that with this printer you can “be fully connected with all of your departments and enjoy the easy-to-use, network-enabled solutions that the SCX-4725FN offers”, that’s not quite so. While you can easily print over the network, there’s not support for network scanning and faxing. You have to connect it through USB if you want to use it full. Speaking of scanning. Color scanning option is not supported, too, so you are limited to black-and-white document scans only. However, for somebody this limitation won’t be critical. One of the most important features SCX-4725FN has is toner save mode. When active it reduces toner consumption by up to 30%, giving you more print outs per Samsung toner cartridge. Despite the manufacturer’s claims of retaining the print quality in toner save mode, the printouts do look really toned down. Another point of notice is long warm-up time. It takes the printer several minutes to get ready from stand by mode. But there’s also a bright side: Samsung SCX-4725FN offers a bunch of copying options. First, clone copying. This feature enables copying the same image in reduced size on one printed page. Next is favorite copy feature that allows making specialized copies easily. You just store a few functions as “Favorite Copy.” Instead of requiring multiple steps to select copy options, pressing the “Favorite Copy” button requires only one step to complete the assigned special copy. With auto-fit copying you can expand a small image to fit the printed page and double sided copies can now be put on one side. The latter copying function allows you to consolidate copies without hassle or wasting time or paper. It’s also worth mentioning that SCX-4725FN is ENERGY STAR compliant. This means you are assured that your Samsung model is helping the environment by using less energy while saving you money. Another way to save money with this printer is to buy Samsung SCX-4725FN toner cartridges in TonerCartridgeDepot.com. This entry was posted on Sunday, March 1st, 2009 at 11:45 am	and is filed under multifunction, Samsung. 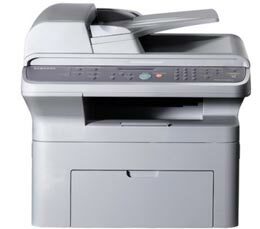 "The new Xerox WorkCentre 4260: inexpensive, but capable"
"Konica Minolta magicolor 7450II GA: The Best Printer for Graphics"